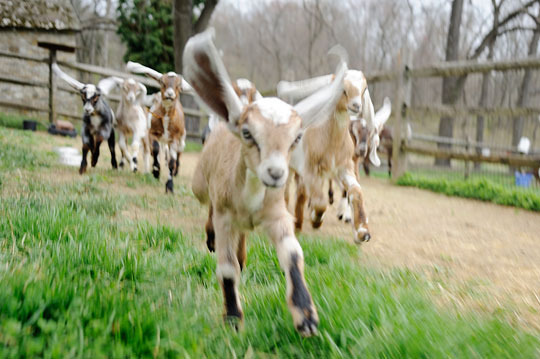 Alongside Pete Demchur’s driveway in suburban West Chester, Pa. is a paddock of big-eared Nubian goats. They chew alfalfa hay, browse for plants, and walk their front legs up the fence to investigate visitors. Beyond the paddock is a stand of lush bamboo. Just beyond that is a group of townhomes. Cheesemaking and caring for the herd could be a full–time job for Demchur, but like many farmers, he has one job to pay the bills (in his case, repairing industrial air compressors), and another to feed the dream. Devoted to his animals, he sleeps with a baby monitor during kidding season, listening to the goats in the barn and ready to assist in labor should the need arise. Demchur and his sister, Donna, sell Shellbark Hollow Farm kefir, yogurt, and fresh and aged goat cheeses at several area farmers markets and restaurants, including Southwark, R2L, Craft Ale House, Kimberton Inn, Styer’s at Terrain, and Di Bruno Brothers. Despite the regional popularity of his products, the farm isn’t universally beloved. “I’ve had some issues with the neighbors complaining,” says Demchur, gesturing to the townhouses adjacent to his property. Like other small farms in suburbia, he is sometimes caught in the clash between rural and suburban priorities. Demchur isn’t an irresponsible farmer. There are no piles of manure on his property and his healthy, happy goats roam, pastured in a fenced network of grassy paddocks. In recent years, he’s actually decreased the size of his herd. But Demchur keeps goats and makes cheese as a vocation, not a hobby. Mucking out stalls isn’t an optional activity, even on the weekends when the neighbors may be barbecuing. He’s unapologetic, but he recognizes that the area is changing, and it’s shifting away from enterprises like his. He looks forward to the day when he can spend all of his time experimenting with new cheese ideas. The future of his farm, however, will likely require relocating. He can count Catherine and Al Renzi, who own and operate Yellow Springs Farm, among his dairy compatriots. The Renzis milk goats and make an incredible variety of cheeses—including two American Cheese Society winners—on their historic Chester Springs farmstead. Catherine describes Chester County as “the dairy for the colonial America… where dairy came from… before Wisconsin, [and] before California.” Today, she, Demchur and the other members of the Chester County Cheese Artisans are working to keep that heritage alive. Though profoundly agrarian in its history, and still the 24th most agricultural county in the nation, Chester County is urbanizing. It ranked highest in Pennsylvania in the 2010 census for per capita income. Property values have increased and it is shifting away from its agricultural heritage in favor of other economic drivers. Bailey reports that there are “a million and a quarter square feet of new office space proposals under review.” As the county changes in its composition, so too does its culture, and Pete isn’t the only farmer who has experienced friction with his neighbors. Catherine Renzi’s theory is that people object to her farm, or the idea of farming in general, because they have no idea what it means to be a farmer. People “know a teacher, a doctor, a librarian, a police-person, a carpenter—name your trade—but have [they] ever met a farmer? A lot of preconceptions and misconceptions come from not knowing.” She refers to a time when everyone was a farmer, when the farm and the homestead were indistinguishable. “This is how people used to live. They had a cow, they had a garden; the landscape and the foodscape were the same.” Now, it seems that people have lost sight of that history. Farming, for the huge investment of work hours required, could be considered an identity as much as a vocation. Small, suburban farms, for the publicly accessible nature of their workspace, are subject to far more scrutiny than the average small business owner. These two factors compound one another and make judgment that much more hurtful. “The farm is us,” says Renzi. “We live this for 15 hours each day, seven days a week. It’s who we are. So, if people oppose the farm, they oppose me.” Critical neighbors, who may have never had the opportunity to see the working side of agriculture, may have purchased homes near farms with no idea of what farming actually looks like. Like so many places, Chester County is at a crossroads that seems to pit suburban development against agriculture and open space preservation. As these two interests come into conflict, they raise the question: What is the place of the farm—especially the livestock farm—in a contemporary community? “The operative word is balance,” says Bailey, referring to Landscapes2, an effort by the Chester County Planning Commission to create a comprehensive land–use policy framework for Chester County. The plan aims to encourage development while maintaining and enriching the agricultural land base. The agency has identified areas in the county appropriate for each function, recognizing development of roads, schools and other amenities—as well as open space and agriculture—as contributors to quality of life. The Agricultural Development Council is also working hard to educate consumers and connect them with opportunities to meet farmers and spend time on farms, in the hopes that having more of an understanding of farming might help consumers appreciate the work of farmers and the existence of farms. Though Pete Demchur’s West Chester farmstead might not be destined to remain where it is, it’s clear that Chester County is trying to make sure that farms like Yellow Spring don’t disappear altogether. After all without local farms there’s no such thing as local food.